Our flatbed is ready to safely transport your vehicle. 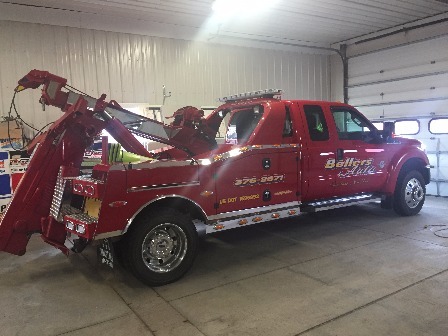 When it comes to light duty towing and recovery, we take pride in our capabilities. Our flatbed is well equipped to get your vehicle safely to its destination. Whether you need us to transport a vehicle across town or have purchased a vehicle out of state, give us a call and let us see if we can assist you in your transport needs. The newest addition to our business is our new Ford wrecker. It is a powerhouse at recovering your vehicle from whatever situation you find yourself in. No expense was spared in the building of this wrecker. With twin 12,000 lb winches, hydraulic stiff legs to hold the wrecker from sliding while winching, and being fully loaded with equipment to do the job damage free. Should you have the need, you will be comforted to know our Auto Collision Repair center is here to bring your vehicle back to it's pre-accident condition. Give us a call to recover your vehicle. Our wrecker is equipped to recovering your vehicle without incurring incidental damage. In a Bind? We'll be There. Pickup and sleds, all recovered with no additional damage! 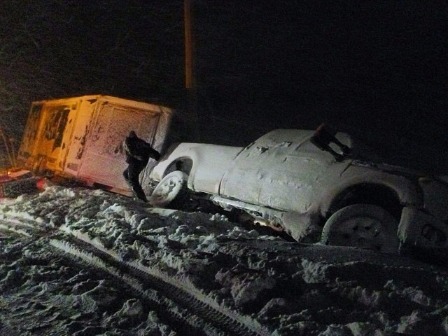 This is an example of the kind of recovery we are capable of, with a fully loaded diesel pickup and trailer with 3 sleds inside, all recovered with no additional damage in a heavy snow storm. 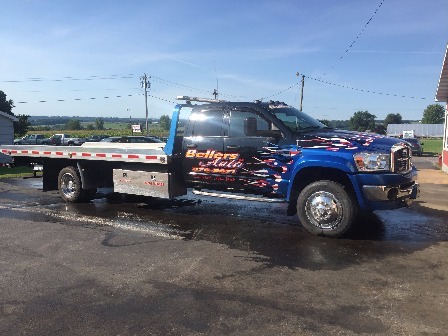 If you need Towing and Recovery service and weren't sure who to contact, please contact us first, we would love to serve you. There is a lot of stress right after an accident. We are there for you and will help you get your vehicle back in pristine condition as well as deal with the insurance paperwork. Come to the place with less stress!